Taking forward the debate on the role and power of institutions for treating and incarcerating the insane, this volume challenges recent scholarship and focuses on a wide range of factors impacting on the care and confinement of the insane since 1850, including such things as the community, Poor Law authorities, local government and the voluntary sector. Questioning the notion that institutions were generally ‘benign’ and responsive to the needs of households, this work also emphasizes the important role of the diversity of interests in shaping institutional facilities. 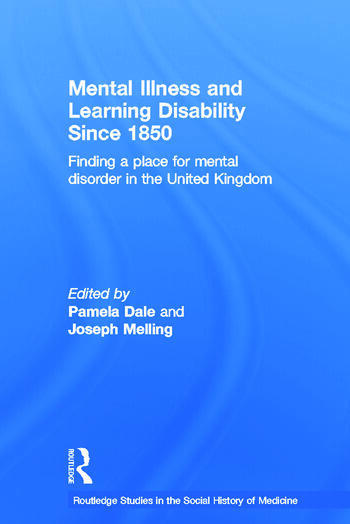 A fresh, stimulating step forward in the history of institutional care, Mental Illness and Learning Disability since 1850 is undoubtedly an important resource for student and scholar alike. Pamela Dale is a Wellcome Fellow based in the Centre for medicinal History at the University of Exeter and is currently working on a project exploring the relationship between health visitors and Medical Officers of Health. Joseph Melling is Reader in the History of Industrial Health and Welfare and Assistant Director of the Centre for Medical History at the University of Exeter.